Swimming pool steps and swimming tips. Great information on wedding cake steps and swimming pool stairs. Pool steps are pretty simple and the concept is the same for virtually any pool. Just like steps going up to the 2nd story of a building, they're meant to either have the person go down into the pool or come out of the pool. This kind of pool accessory is a major player in your swimming safety protocol. 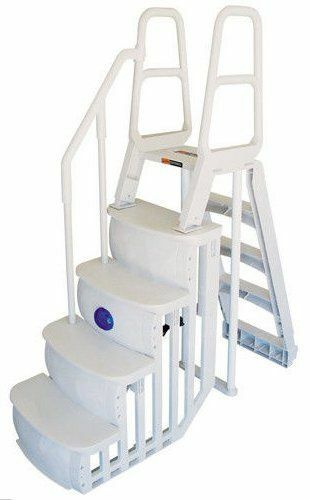 These metal or plastic stairs should be the main entry and exit points of the pool and can be just as dangerous as the water itself because of slipping and falling. Also, if you're in the market for a good swimming pool ladder, get a set that matches. It just looks better and you'll have a pool that looks clean and inviting. Any type of pool steps meant for aboveground or inground pools normally use an "A-frame" system that hooks on both the inside and outside of the pool. 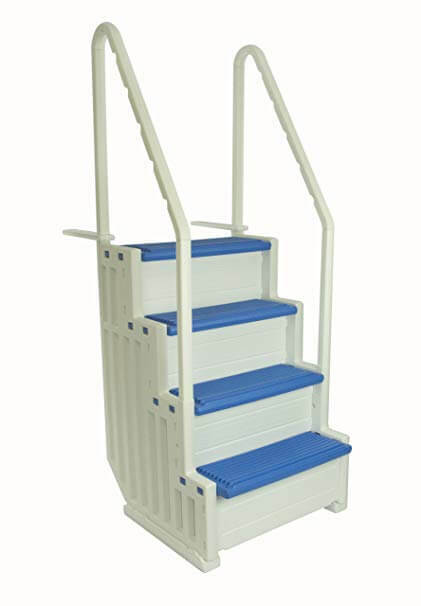 Pool steps and stairs are easier and safer to use than vertical pool ladders. In ground pool steps are not just for looks, but they need to serve a function. Normally, above ground and inground steps will range in price from $500 - $700, depending on the model and any extras you may want. Can be adjusted from about 48" to 54"
Weight capacity between 350 lbs. - 400 lbs. When winterizing a pool be sure to remove them and also have someone who knows pool step repair in the event that something breaks. 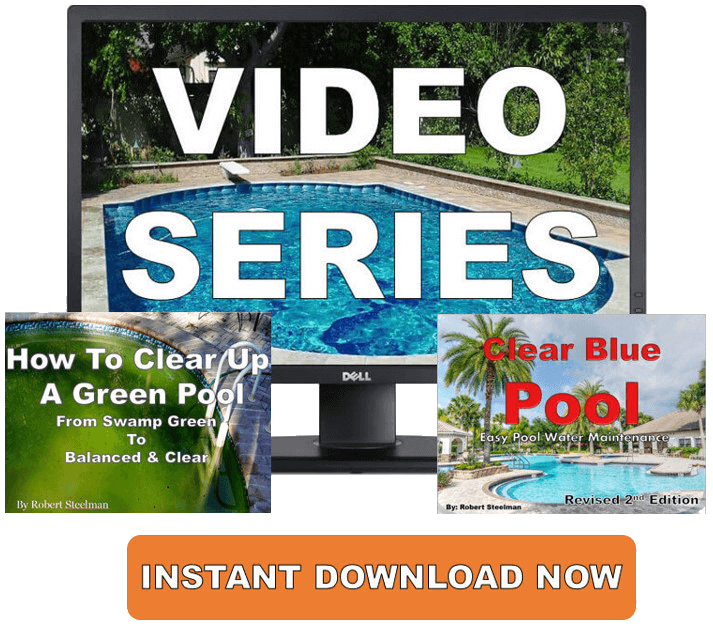 There are many types of pool steps from which to choose and getting the right one for you that's fits your budget and needs are the important parts. Most above ground pool packages usually come with a standard A-frame type ladder or step. But different people have different needs so it's worth investing a little time now to learn about the different options that are available. If your pool doesn't have a deck, this kind might be right for you. Having a ladder on the outside of the pool works well for steadiness and balance while the steps on the inside of the pool are wider and more steady than ladder rungs. This is great for people with mobility issues, the elderly, or larger bathers. Swimming pool steps should mainly be a point of entry and exit from the pool and for durability and enhanced balance, this is the one you want. The steps are wide and flat making entering and exiting the pool easier. And the sturdy handrails are good for those who have a hard time climbing in and out of the pool. This is also a good option for those who may not have a deck around their above ground pool. The weight limit for many of these steps is about 500 lbs. and they are also the most expensive system that can cost upwards of about $500 - $600. They're called Wedding Cake Steps due to the fact that they're rounded and the steps get larger as they go into the water. Normally, wedding cake steps will have one handrail that runs either through the middle or the side of the steps. The steps are curved all the way around which means there's less of a chance of getting cut or injured and there's more of a "landing" step area for increased safety. These steps don't attach to the pool, per se, so weighing them down is important. They are a bit larger, in terms of taking up more room in the pool, so these kinds of steps might not be the best option for smaller pools. One big advantage of these swimming pool steps is not much assembly is required so you can have your steps installed within a matter of minutes. Are you frustrated with your cloudy pool? Has it been weeks since you've seen the bottom? 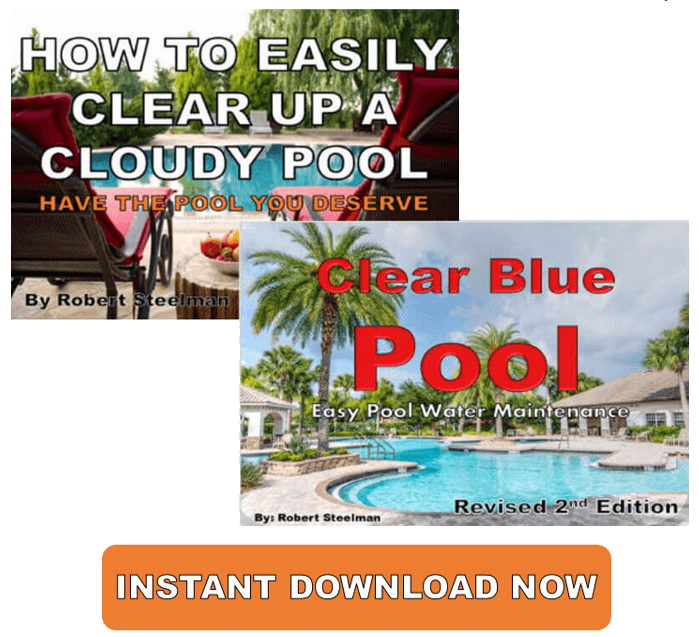 "Clear Blue Pool Revised 2nd Edition" & "How To Easily Clear Up A Cloudy Pool" eBook Combo Package teaches you all you need to know about clearing up and maintaining your pool. Also included is my exclusive F.T.A. Process on clearing up green and cloudy pools. Click the download button or HERE to get started today!! For above ground pools, most swimming pool steps will start around $200 and go up to $250 so they won't break the bank. They should be a fun addition to any pool. Just do your homework and find the one or pair that works for you and your budget.